Just upgrading your connection speed can eventually help to increase the productivity of your overall workflow. Faster speed can help to finish task over the web quickly no matter whether you are downloading a heavy file, uploading a file, downloading any movie or song, power point presentation or just doing any small to big work. There are a number of different works over the web which can be finished quickly if you have faster connection. If your workflow will increase, it will eventually increase your business profit too. There are many connections of latest technologies which can be asked by you from your ISP to provide you. Every business aims to expend itself by creating place in the heart of its targeted customers. Reaching out to the last customer is not an easy task for any business. It needs a proper planning, effective strategies and better techniques but one thing that is quite important in today’s digital era is the ultra fast speed of your connection. Today a large number of businesses are completely relied on broadband connections therefore having a steady connection with faster speed is highly essential. For a businessman, it is necessary to keep updating its business with current techniques and resources for better results and having a better connection is one of them. A steady connection is always seen as a main sales force of any business in today’s time. You might not find upgrading your connection a cheap call but when you look at the workflow and productivity of your business after upgrading the connection, you will surely not hesitate in getting a little extra bandwidth for better speed. If your connection speed is good then it is good for your business. As mentioned earlier too that it is hard to think of any business without its appearance over the web in today’s competitive time. To run business successfully over the web, it is highly necessary for entrepreneurs to have a good connection with strong connectivity because if the speed of a connection hampers then the productivity of the work will automatically hamper. Securing data on the web is highly important therefore many entrepreneurs take backup of their entire data over the cloud and to upload the same, there is a need of connection of faster speed. There is no doubt that if your connection is slow, your business productivity will ultimately become slower. Therefore to manage business your business effectively, you need to have a good and reliable connection. Today there are many ISPs available in various parts of India but when it comes to getting a trustworthy and reliable broadband service provider in Delhi NCR, then there is no match of TriplePlay. With latest technology in its connection, strong connectivity and prompt customer support make it different from other ISPs in Delhi NCR. It offers various unlimited data plans as per users’ need and requirements at unmatchable prices. 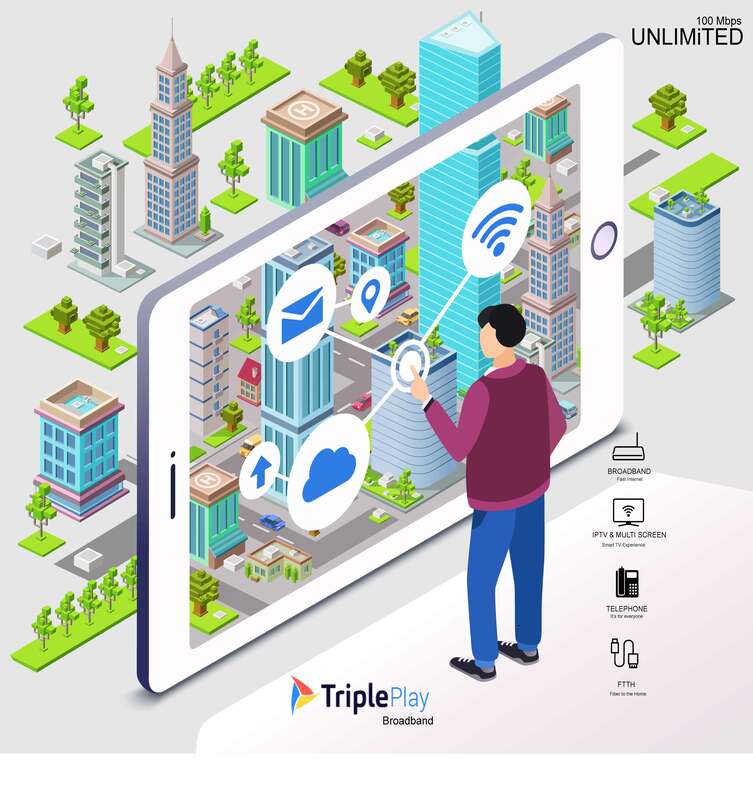 So enjoy internet like never before with TriplePlay and give a new wing to your business!